An NHL organization’s health is now defined by three things: your goaltending depth chart, your centers, and the presence of a young star defenseman. Just look at the Rangers and Kings. Drew Doughty and Ryan McDonagh will be the faces of their franchises’ blue line for years to come. And of the teams in the Western Conference to make the playoffs, the Sharks are considerably behind the curve on the back end. The reluctance to resign veteran Dan Boyle and then subsequently trading him are merely a sign of the defensive youth movement in the NHL. If there was one for sure thing this offseason in San Jose, it was the prophetic monologue from GM Doug Wilson concerning Boyle. Various reports indicated Boyle was looking for a two-year deal from San Jose, which only offered him a single year, according to Yahoo! Sports. With Boyle as the first Shark domino to fall, its sets the stage for progressively larger moves and finding a younger, more face-of-franchise type replacement for Boyle, and setting up one of the most active offseasons in recent memory. Looking at the Sharks offseason from a racing perspective, Boyle was the pace car. It was a given he was going to hit the open market or be moved, it was just a matter of when. The rest of the defensive unit is now trailing behind and jockeying for playing time and should be the most scrutinized group of players the Sharks’ front office discusses. Of the Sharks defensemen to lead the team in ice time in 2013-14, Marc-Edouard Vlasic is the closest thing to a lock for next year’s opening day roster. During the four-game collapse to Los Angeles, the Sharks’ defensive unit combined for a minus-19 and looked every bit of it. They were out hustled and over matched on virtually every shift with considerable Kings’ offensive time, indicative of allowing more than 30 shots and being outscored 18-5 in the 4-game reverse sweep. Even if Vlasic were present for games six and seven, the Sharks would’ve met the same fate. There’s only so much one defenseman can do against a team that is rolling on all cylinders. Besides Vlasic and the departed Boyle, the usual victims of the Kings’ onslaught faired to a minus-15 in those four forgetful games. When looking ahead to the landscape of the rest of the Pacific Division, the Sharks will have to face the maturing Edmonton Oilers, the dynasty-ready Kings, Vancouver’s Sedins, the Ducks’ depth scoring, and the up-and-coming Flames’ offenses, all with a group of blue liners that have been bailed out more than their fair share by Anti Niemi, one of the best regular season goaltenders in the last decade. The Sharks have decisions to make with Scott Hannan (35 years old) and Jason Demers (26) who are unrestricted and restricted free agents, respesctively. Demers is the most likely to be resigned, as the Sharks have kept him cost controlled since he broke in with the big club and has played big-time minutes in his 280 career games. He is coming off a career year with a plus-14 and 34 points and was a part of one of the better second power play units in the league. 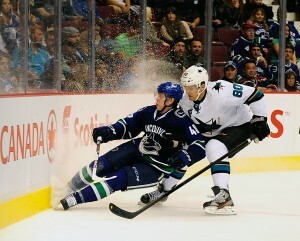 He is worthy of a top four deal with the Sharks to provide more a mix of experience and growing offensive potential. As the older of the two free agent defensemen, it isn’t likely Hannan is in the Sharks’ future plans. He equaled the third-most penalty minutes of his career and in a league growing faster and more talented, Hannan’s place the rest of his career in this league will be as a sixth man on the blue line. He’s had a solid career, especially in his three tours with San Jose but with the more promising Mirco Mueller waiting behind him, he provides the triple threat of attributes the Sharks’ blue line is desperately in need of: speed, offensive awareness and youth. Mueller was drafted No. 18 overall in the 2013 NHL Entry Draft and immediately drew comparisons to his Swiss counterparts Luca Sbsia and Roman Josi with more ability to create offense with his skating ability. The remaining defensemen could all be pieces of larger player movements to land a clear-cut number one defenseman, move up the draft board, or provide a little more depth and quickness on the blue line and on the wings. Those include Brad Stuart, Matt Irwin and Jonny Braun who are all unrestricted free agents at the end of next year. 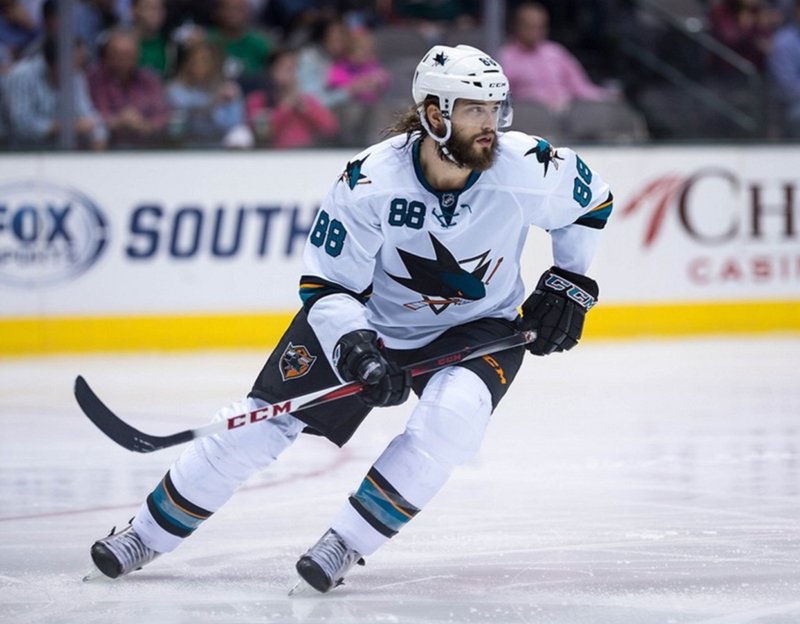 The move that generated some buzz for a brief spell was the consideration of moving hybrid Brent Burns back to his original position. In the mold of a Dustin Byuflien, who would be a tremendous fit and provide instant tenacity and offensive firepower from the point, Burns had tremendous success as a forward since his acquisition from the Wild. 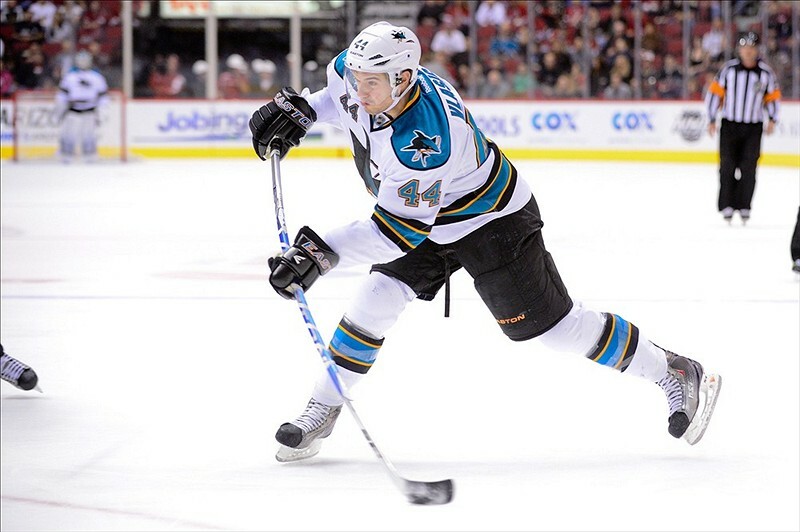 He has clicked with Joe Thornton to provide girth and a solid one-two punch on a forward line. Albeit a good one to have, the problem with Burns is his versatility. Leave him alongside Joe Thornton or move him back to defense? The Sharks possess great forward depth and young, fast talent that fits right in with the transition of NHL offenses these days. Burns breaks the mold and would be more of an asset on the blue line where the Sharks are clearly lacking, as illustrated by Los Angeles in the first round. Ideally, a pairing of Vlasic and Burns would slow down the run and gun offenses in the West and create favorable matchups in the Sharks favor, especially in the neutral zone. They would arguably become one of the best pairs of defensemen in the Pacific, somewhere close behind Drew Doughty and Robin Regehr in Los Angeles and ahead of Keith Yandle and Oliver Ekman-Larsson in Phoenix. In a recent interview with CSN Bay Area, head coach Todd McClellan said there was a need for guys with more toughness and there hasn’t been many who question Burns’ motor or intensity. Might be a within the organization type solution. With a Vlasic and Burns pairing as 1-2, the ideal supporting pairs would line up as Demers/Stuart and Mueller/Braun with the current roster. The 2014-15 Sharks defensive corps’ success rests on the shoulders of Burns, who should quickly regain his top defenseman status as he enjoyed previously in Minnesota. Their best playmaker on the back end has been swapped for a fifth round pick in next year’s draft and might look considerably different come next year. Burns is no slouch, no matter where you play him. But the depth San Jose possesses up front makes him more valuable on defense. It’s not often that a defense that ranked near the top in the league during the regular season in goals against needs significant tweaks near the top. Then again it’s not often when a cup favorite when the playoffs begin collapses in historic fashion. The more moves the Sharks make to signify last year was far from acceptable, the less time Sharks fans will have to wait to raise the banner they ultimately want.